Thin, sleek, solid. Work on the go, without the extra bulk. 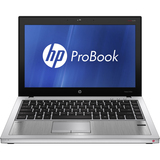 Thin and lightweight, this secure, manageable HP ProBook with a 13.3-inch diagonal display delivers business performance in and out of the office.